"Pipe down ya bastards! The babies are trying to sleep!! Oraaaa!!!" A stereotypical high school delinquent who hangs around Askusa in Taito Ward. 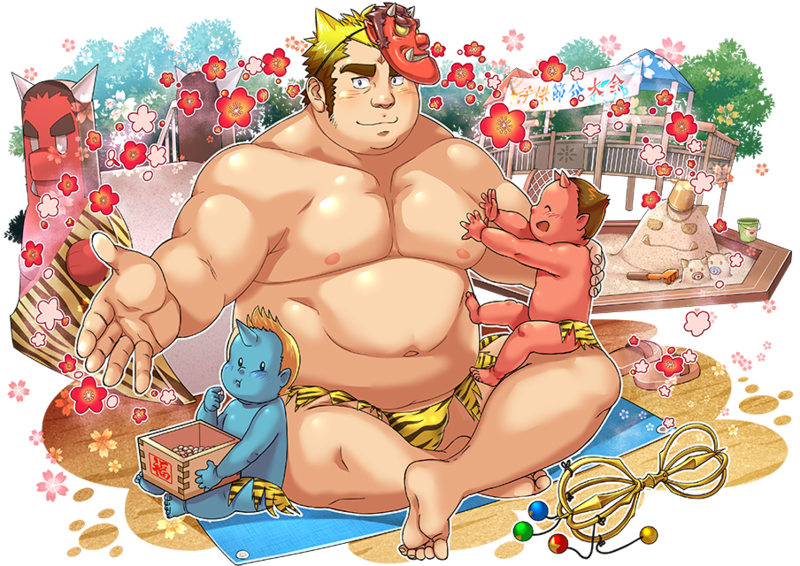 Due to certain events, he ended up adopting two oni infants, Zenki and Goki, as their papa rather than their Summoner. Ever since he was small, he'd get into fights after staring people down, but he's also sentimental, easily moved to tears, and has a caring hear of gold when it comes to kids. He dyed his hair blond, thinking that looking strong would prevent others from picking fights with him, but this ironically led to more frequent conflict. A high school delinquent from Taito Ward. 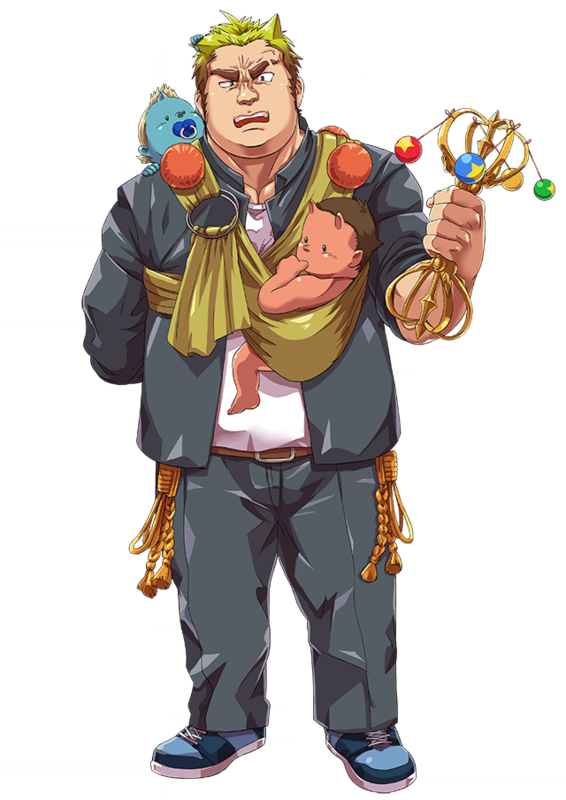 Under strange circumstances, he came to be the caretaker of two oni babies. Although they are stray summons, his relationship with them is more akin to a father than a summoner. In spite of his rough appearance, he's really kind of a weakling. The true Motosumi is a friendly young man who loves children and would really rather just get along, but the thuggish face he was born with caused him endless grief throughout his life as other students took him for a delinquent and either ostracized him or started fights with him constantly. Over time Motosumi adopted the style and mannerisms of a punk, dying his hair blond and perfecting his sneer over long practice sessions, in hopes that he might finally be left alone if he looked tough enough. Unfortunately, this only exacerbates the problem. He owns a Sacred Artifact in the form of Vajra that can exorcise even oni but is generally used as a baby rattle. Whenever he falls unconscious in battle, the oni pair Zenki and Goki will appear in their true forms. Zenki bears the power of fire while Goki bears the power of water. When he awakens after battle, they will have returned to their infants forms. He seems to get along well with people who love children. His Sacred Artifact is a vajra, a ritual object that supresses the power of demons. Motosumi, on the other hand, uses it primarily as a rattle. When he faints in battle, the babies manifest their true forms: Deadly twin Oni of fire and water who show no mercy to any opponent that would lay a finger on their papa. When the battle is over and Motosumi wakes up, the oni will have already reverted to their baby state with him none the wiser. As part of the child onis' education in good taste Motosumi is engaging with the Setsubun event. Dressed up in the disguise he borrowed from a friend he's ready for the oni role of being pelted at with beans. He's doing nothing but standing guard and saying "come at me!" but the children eating Setsubun lucky charms has put him in a daze. Half monk and half layman, he hums mantras to the orphans abandoned at the temple instead of lullabies as it seems his monk training has been ingrained into him. His Role is to shelter, raise, and take the sins of those chased out from the world with no other choice. He has a low opinion of people who treat parent-child relationships as just a tool. I'll make you happy for sure. So, will you come live with me? I've fallen for you. Why does he hate Gamr? This daddy finally got a scene! Ooof! He has zero character though. This page was last edited on 12 April 2019, at 22:49.